There are various approaches for scheduling irrigation. One approach is to supplement rainfall with enough irrigation so that the cumulative rainfall and irrigation, over a specific period of time (e.g., one day, one week, one season), matches the estimated crop water requirement. 2. Now it gets easier. Go to the appropriate reference evapotranspion (ETo) map(s) for Puerto Rico and determine the ETo for your location CLICK HERE. Note, if you are irrigating ever day, then you only need to obtain the ETo for yesterday’s date. If, however, you are irrigating once per week, for example, then you will need to get the ETo values from the maps for the previous week. In this latter example, you will need to sum the daily values of ETo to obtain a value of the weekly ETo. 3. From your Kc curve, determine a representative value of Kc for the time period of your analysis (e.g., daily or weekly). 4. Estimate the crop water requirement (crop evapotranspiration) ETc = Kc x ETo. 5. Estimatate the required depth of irrigation: Irrigation = ET – Rainfall. If the estimated Irrigation is negative, then you do not need to irrigate. It is recommended that you measure the rainfall on your farm with a rain gauge, however, if you do not have access to the measured rainfall, you can obtain an estimate of the rainfall (derived from NEXRAD radar) by clicking here. The irrigation scheduling approach described above is based on various simplifying assumptions (e.g., surface runoff and deep percolation are ignored). Nevertheless, it will vastly improve your water management if you are not currently using an irrigation scheduling method. To evaluate your irrigation management, you may want to construct a graph similar to the example provided below. The graph shows the cumalative depth of irrigation and ETc plotted with time. If these two curves stay close together then you are doing a pretty good job of managing your irrigation. 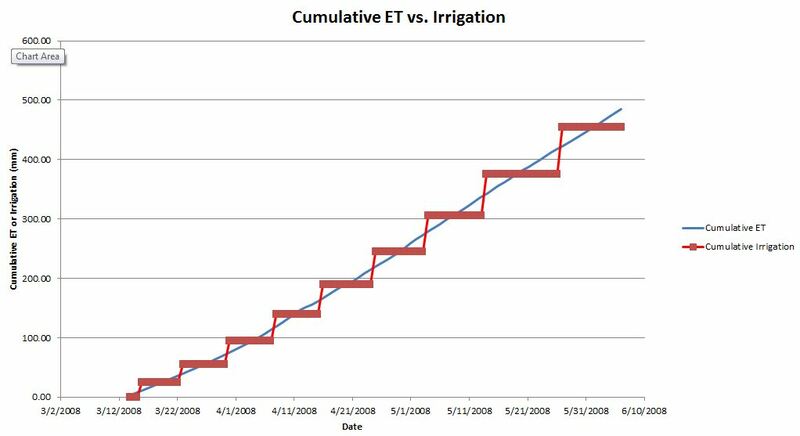 Example of the cumulative irrigation and ET plotted with time for a crop season. The goal of irrigation scheduling is to try to match the applied irrigation with the ET. By the end of the season, the cumulative irrigation should more or less equal the cumulative ET. In the discussion about the crop coefficient curve I suggested that you may want to generate the Kc curve using the computer program PRET (https://pragwater.com/crop-water-use/). If one goes to the trouble of downloading and installing PRET, then why not just estimate the ET values with PRET? The reason is that PRET gives you estimates of the long-term average ET. The scheduling tool described in this post, on the other hand, allows you to use estiamtes of the actual ET in “near real-time”. If it is a very warm, dry year, for example, PRET will underestimate the crop water requirment, and if it is a wet year, it will over estimate the crop water requirement. In PRET you can easily generate the Kc curve data for 15 vegetable crops, loaded into the programs database. However, it also lets you enter the initial, mid and end crop stage Kc values for a generic crop. So the program is useful for generating the Kc curve for any crop. This looks fascinating – I’m curious about irrigation but know little about it, not to mention Kc curves. I hope you don’t mind a novice question, but where, when, and by whom is this schedule applied? Thanks! Glad to have discovered this site. Where, when and by whom?? Great question. Anybody that is applying irrigation water should be scheduling their irrigation. Unfortunately many farmers do not use a systematic approach to determine if they are applying the correct amount of water. In many cases the farmer will turn on the valve and return to shut it off 4 to 6 hours later, perhaps thinking that if they go a little extra time then at least the plants will get enough water. The problem is that when you multiply the wasted water (that percolates past the root zone) by hundreds of farms, this amounts to a huge amount of wasted water, energy, money, and possibly leached chemicals that will contaminate the groundwater. The flip side is when the farmer does not apply enough water. This can really impact crop yield and this translates into a loss of money for the farmer. The example that I give my students at the University of Puerto Rico involves calculating the amount of money lost from a 10 acre calabaza (squash) farm when too much water is applied and too little water is applied. The greater loss in revenue occurs when too little water is applied (due to reduced yield), and amounts to enough money for the farmer to send his kid to the university for one semester (tuition is pretty cheap here in PR). Where? at any farm where irrigation is applied. When? during the entire growing season. Who? every farmer that uses irrigation. Of course this would apply generally to all irrigation systems used for landscaping, athletic fields, golf courses, etc. You have done a truly great job by putting this page together. The information found here is very useful. I am very proud to have been your student. Thank you! Wow Manuel! Thank you! I also am very proud to have been able to work with you. I can’t wait to see all the great stuff you are going to do throughout your career.